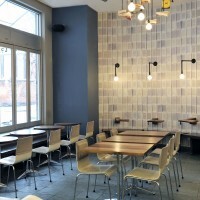 New York based Front Studio have completed the design for the renovation of the McNally Jackson Cafe, which is part of the McNally Jackson Bookstore in Manhattan’s Nolita neighborhood. 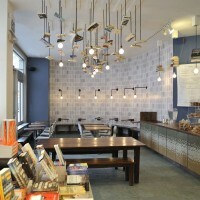 McNally Jackson Books is one of the largest independent booksellers in downtown Manhattan. 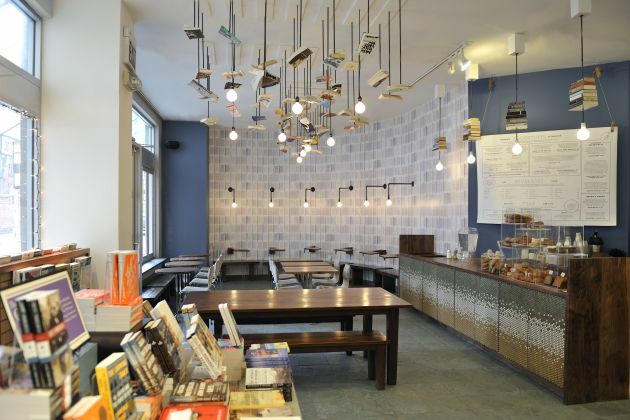 The owner wished to re-conceptualize the café as a place evocative of literature. 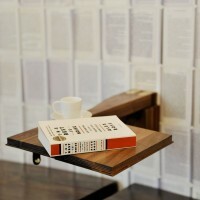 A fluid collaboration between the owner and architects, all avid readers, the newly realized space creates visceral connections to the act of reading in each programmatic function. 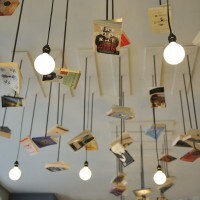 A scattering of books hangs precipitously from the ceiling, as if a pile of books had been thrown into the sky and frozen. 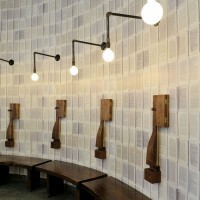 The curved wall surrounding the seating area is covered in wallpaper made entirely of open spine books, the texture of the print adds a rippling effect of restless pages. 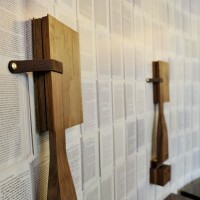 Running along the wall is a series of folding single tables, carefully crafted to resemble a folded book when closed. 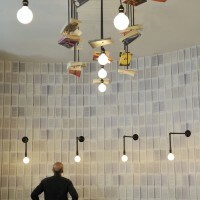 The new menu is made of food related quotes lit by 4 light fixtures, each dedicated to the many editions of a singular book. 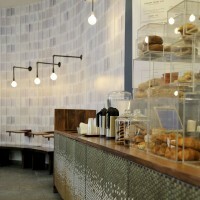 Visit the Front Studio website – here.